For active adults who want a housing option that fits their needs better than single-family homes, Overture Flower Mound offers a selection of maintenance-free apartments in Flower Mound, Texas. This 55+ age-restricted apartment community is a top-of-the-line rental option in the Dallas area because of its feature-rich apartment homes, attractive amenities, and lifestyle opportunities. Residents also have convenient access to everything the Metroplex is known for, including its global cuisines, eclectic shops, and outdoor recreation. Active adults seeking age-restricted rental apartment homes in Flower Mound might find everything they're looking for at Overture Flower Mound. Overture Flower Mound sets itself apart from other apartment home communities by offering a rich selection of amenities. The community centers around 13,000 square feet of space dedication to its resort-style amenities. 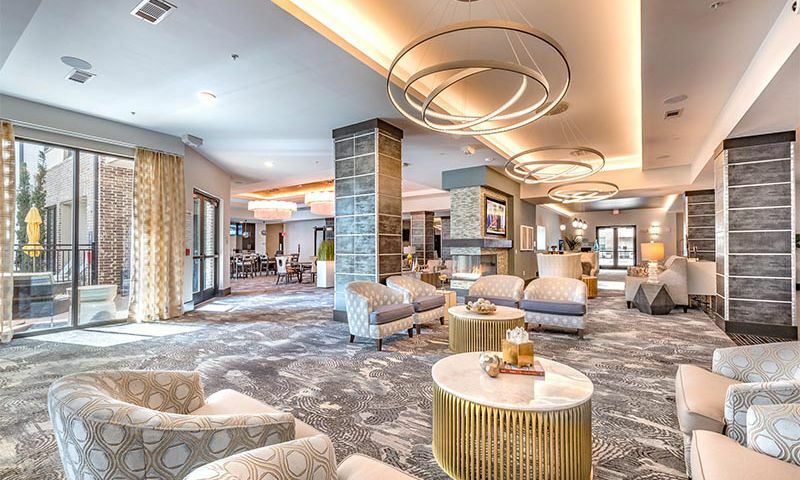 Residents of Overture Flower Mound have access to a game room, library, and theater, all great options for relaxing and meeting with neighbors. A fitness center and yoga studio provide regular exercise classes. A demonstration kitchen teaches cooking skills and classes so residents can learn to make new meals. When they don't want to cook, residents can visit the bistro cafe for a bite to eat. The dining options continue with the community's spacious dining area. The dining room doubles as a meeting space where large community events and social happenings can occur. For those who have some work to do, a business center and mailroom help make it possible. Residents can even have a salon experience right inside the community with a hair and nail salon. Outdoors, the amenities continue with a hot tub and swimming pool, barbecue grill, and community garden. Just a short walk away, residents can visit a community dog park to spend some time outdoors with man's best friend. Overture Flower Mound includes 200 apartment homes that range between 616 and 1,425 square feet. The one-bedroom and two-bedroom homes include popular design choices such as wood-style plank flooring and inset mud bench areas for shelves and coat hooks. Kitchens are built with granite countertops, prep islands, and stainless steel appliances. In the bedrooms, residents find plush carpeting, a ceiling fan, and walk-in closets, while bathrooms feature granite countertops and walk-in tiled showers. Each apartment also has a full-size top load washer and dryer, which many active adults appreciate as an everyday convenience. Private balconies and patios add outdoor living space to each apartment home. Residents can also take advantage of the community's additional storage space. With so many lifestyle activities, social clubs, and even educational experiences, residents of Overture Flower Mound can make memories with friends and neighbors as often as they like. Some of the community's popular events include movie nights, game nights, and holiday parties scheduled throughout the year. Residents can participate in cooking classes together and then bring something to one of the several potluck dinners. Book club and crafting events are a relaxed way to enjoy a social activity. Classes in the fitness center include water aerobics, Wii fitness training, Zumba, and Tai Chi. For residents who like group outings, the community plans trips to sporting events and local activities. In addition to these pleasant activities, Overture Flower Mound supports residents who want to learn new skills or pursue new hobbies. Residents partake in classes on safety, wellness, and nutrition that the community hosts regularly. Other classes include topics like computers and software, history, writing, and ancestry research. Overture Flower Mound is located in Flower Mound, Texas close to Highway 121 and Lakeside Parkway, a favorable location for living an active lifestyle and making the most of the activities and attractions of the surrounding area. Even though it's easy to drive and use public transportation to get around, the community partners with Lyft to help residents travel where they need to go. When residents want to head to the big city, they’re just 45 minutes from both Fort Worth and Dallas. There are plenty of grocery stores and shopping centers just down the road, including Tom Thumb, Sprout Farmers Market, Walgreens, and Walmart. Its close proximity to Cross Timbers and Grapevine Mills makes this community something of a shopper’s paradise. The food options close by include Anamia’s, Ista Indian Cuisine, Fish City Grill, Dido’s Urban Grill, and Paradise Bistro & Coffee. For health care, Texas Health Presbyterian Hospital, Select Medical Therapy, and Heritage Women’s Health Center are all close by, among other facilities. Those looking to get outdoors for some fun can go kayaking at Lonestar Adventure Sports or enjoy dinner and a movie at Moviehouse & Eatery. For active adults who want to travel more, Dallas-Fort Worth International Airport is just 15 minutes away. There are plenty of activities available in Overture Flower Mound. Here is a sample of some of the clubs, activities and classes offered here. Overture Flower Mound consists of 200 apartment homes that range between 616 and 1,425 square feet. The one-bedroom and two-bedroom residences feature wood-style plank flooring and inset mud bench areas for shelves and coat hooks. Want to learn more about Overture Flower Mound?